ASROC (for Anti-Submarine Rocket) is an all-weather, all sea-conditions anti-submarine missile system. After a surface ship, patrol plane or anti-submarine helicopter detects an enemy submarine by using sonar and/or other sensors, it could relay the sub's position to an ASROC-equipped ship for attack. The attacking ship would then fire an ASROC missile carrying an acoustic homing torpedo or a Nuclear Depth Bomb (NDB) onto an unguided ballistic trajectory toward the target. At a pre-determined point on the missile's trajectory, the payload separates from the missile and deploys a parachute to permit splashdown and water entry at a low speed and with minimum detectable noise. The water entry activates the torpedo, which is guided by its own sonar system, and homes in on the target using either active sonar or passive sonar. In cases where the ASROC missile carried an NDB, the unguided bomb would sink quickly to a predetermined depth where it would detonate. The nuclear-armed ASROC was never used beyond one or two tests in 1961-62. Eventually the Limited Nuclear Test Ban Treaty banning underwater nuclear tests went into effect. The nuclear weapon was never used in combat. An ASROC missile could hypothetically carry a 10 kiloton W44 nuclear warhead, although the W44-armed nuclear weapons were retired by 1989, and all types of nuclear depth bombs were removed from deployment. The first ASROC system using the MK-112 "Matchbox" launching and reload system, was developed in the 1950s and installed in the 1960s. This system was phased out in the 1990s and replaced with the RUM-139 Vertical Launch ASROC, or "VLA". The thirty-one U.S. Navy Spruance-class destroyers were all built in the shipyard with the Mark 112 ASROC launcher and reload system. These had one standard Mark 16 octuple ASROC launcher, located immediately above a reload system holding an additional 16 assembled rounds (two complete reloads of eight missiles apiece). Thus, each Spruance-class destroyer originally carried a total of 24 ASROC. 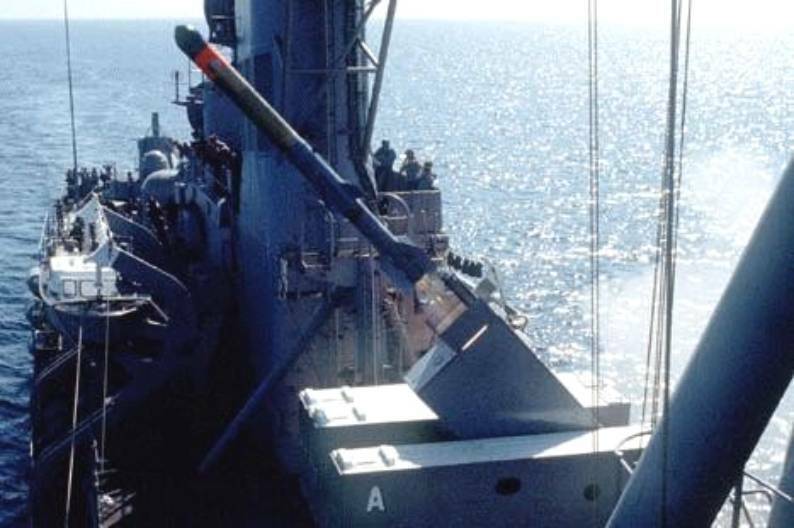 Most other U.S. Navy and allied navy destroyers, destroyer escorts, frigates, and several different classes of cruisers only carried the one ASROC 'matchbox' launcher with eight ASROC missiles (although later in service, some of those missiles could be replaced by the Harpoon anti-ship missile. The "matchbox" Mk 112 launchers were capable of carrying a mixture of the two types. Reloads were carried in many classes, either on first level of the superstructure immediately abaft the launcher, or in a separate deckhouse just forward or abaft the Mk 112. 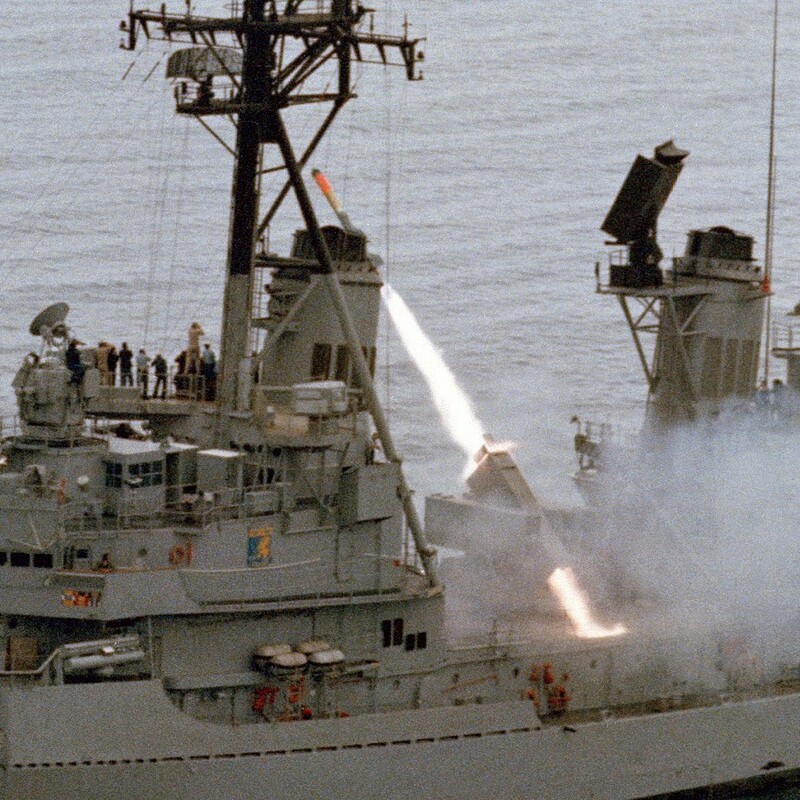 Ships with the Mk 26 Guided Missile Launching System (GMLS), and late marks of the Mk 10 GMLS aboard the "Belknap"-class, could accommodate ASROC in these power-loaded launchers (the Mk 13 GMLS was not able to fire the weapon, as the launcher rail was too short). Brazil, Canada, Germany, Greece, Italy, Japan, Mexico, Republic of Korea, Pakistan, Spain, Taiwan, Thailand, Turkey.